Liverpool are "rudderless" and "going backwards just as fast as they went forwards last season", according to former player Mark Lawrenson. Lawrenson says he is baffled by some of the team selections and accuses manager Brendan Rodgers of changing his side "like he does his socks". The BBC Sport pundit also says Daniel Sturridge will not prove to be the "saviour" of the Anfield club. Yet he feels the Reds can still qualify for next season's Champions League. Liverpool went out of the Champions League at the group stage following Tuesday's 1-1 home draw with Basel and lie ninth in the Premier League ahead of Sunday's visit to Old Trafford to face Manchester United. Lawrenson believes the club have regressed since the fixture between the sides last March, when Steven Gerrard scored two penalties and missed a third in a 3-0 victory over the then Premier League champions, and worries that Rodgers seems unsure of how to set up his team tactically. "It is eight months since Liverpool blew Manchester United away to win 3-0 at Old Trafford but it seems an awful lot longer than that," he said. "To be frank, Liverpool are all over the place at the moment. They are rudderless, low on confidence and do not seem to have a definitive way of playing." 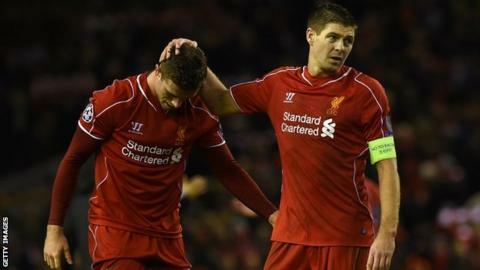 The former Liverpool and Republic of Ireland defender was particularly scathing about Rodgers' team selection for the must-win match against Basel at Anfield, feeling that England international Adam Lallana, 26, should have started in midfield and questioning the inclusion of Jose Enrique at left-back. "I do not understand some of Brendan Rodgers' selections - leaving Lallana out against Basel mystified me, as did the inclusion of Enrique, who looked overweight," he said. "When you don't qualify, everyone gets looked at - across the board we have been looked at and analysed. For us the solution is simple, we have to be better in our performance level. "The expectation coming into the season was high but it is a different squad and a different group of players." Liverpool finished runners-up to Manchester City in the Premier League last season, in large part thanks to Luis Suarez's 31 goals in 33 matches, and Lawrenson feels that Rodgers has failed to adequately replace the Uruguay international, who joined Barcelona in July in a £75m deal. "Some of Liverpool's key players have lost form but what has happened this season shows how much they relied on Suarez and Sturridge - those lads were clearly more than just 50% of the goals, they were 50% of the whole team," he continued. "That's the only conclusion you can draw from what has happened without them." Sturridge has not featured in the first team since the start of September after suffering thigh and calf injuries and Lawrenson warns that the England striker may take time to match the form he showed last term in partnership with Suarez. "Sturridge is getting built up as Liverpool's saviour because they have struggled in his absence. But he won't be. We don't even know when he will be back," he said. Rodgers spent £116m in the summer on Lallana,Lazar Markovic,Dejan Lovren,Mario Balotelli,Alberto Moreno, Emre Can,Javier Manquillo,Divock Origi, who was immediately loaned back to Lille, and Rickie Lambert, but Lawrenson feels the new signings have yet to hit top form and worries that any new additions in the January transfer window will also struggle to make an impact at Anfield. "Everyone is saying that Brendan Rodgers has got to buy players in January to turn things round but it is not that easy," he said. "For starters it is difficult to buy anybody of quality in January, but also, they need to improve in pretty much every department because nobody is playing well." "The Europa League is a nuisance for Liverpool. But at least now it is knock-out and as a manager Rodgers can decide on a round-by-round basis on what he wants to do, and view the Europa League two days before he plays each tie. "There is a Champions League place at the end of it. That is not a factor now but that changes the further you go in the Europa League and also if the top four becomes less likely in the Premier League." Lawrenson says that Liverpool can still qualify for the Champions League next season, by either taking the spot reserved for the Europa League winners or focusing on the "all day long priority" of securing a top-four finish but warns that Rodgers faces a tough task if he is to reverse the slump. "Last year Liverpool built up such momentum that it felt like he could just send the players out and they would sort it." he said. "Now you look at it and it seems like the same scenario in reverse - they are going backwards just as fast as they went forwards last season. "It is down to Rodgers to stop it and change the direction of their season around but boy is it a steep learning curve for him."